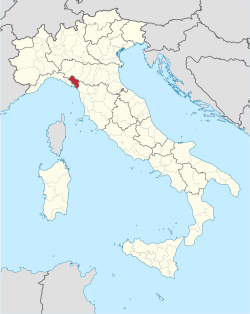 The Province of Massa-Carrara (Italian: Provincia di Massa-Carrara) is a province in the Tuscany region of central Italy. It is named after the two main towns in its territory: Carrara and Massa, its capital. Historical map of provinces of Massa, Lucca, Pisa and Livorno (1896). The province of "Massa e Carrara" was born in 1859 from the separation of the Lunigiana and the Garfagnana from the Ducato of Modena. Originally it was composed of three circondari: I° "Circondario of Massa and Carrara" (a group of seven districts divided in 14 municipalities), II° "Circondario" of Castelnuovo Garfagnana (four districts divided in 17 municipalities), III° "Circondario" of Pontremoli (three districts divided into six municipalities). Until the census of 1861, the province appears as part of Compartimento territoriale Modena, Reggio and Massa, but since the census of the population of 1871 it has been counted as part of Tuscany. Later, with the "Regio Decreto n. 1913 of September 2, 1923", the municipalities of Calice al Cornoviglio and Rocchetta Vara were detached from the province, and added to the new province of La Spezia. 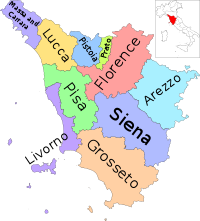 In the same period ("Regio Decreto n.2490 of November 9, 1923") the 17 municipalities of the "Circondario" Castelnuovo Garfagnana were removed from Emilia and assigned to the province of Lucca, in order to compensate for the passage to the new province of Pistoia of all the municipalities of the Val di Nievole. The province of Massa and Carrara was left crippled, waiting for a reorganization. In 1938, the municipalities of Carrara, Massa and Montignoso joined and became the municipality of Apuania. In the same year, the industrial zone Apuana was instituted, including in relative Consortium C.Z.I.A the municipalities of neighbouring Versilia, and the province assumed the name of province of Apuania. In 1946, with decree Lieutenant one (Umberto II of Savoia) the new municipality of Apuania was formed, and the province (for error and/or historical ignorance) resumptions the denomination does not date from 1859 when it was "Massa and Carrara" but Massa. This was the name that had been designated to the city of Massa or Massa of Carrara from 1700 until the formation of the Kingdom of Italy (1860), to distinguish it from other homonymous cities. In 2009 both decrees of 1938 and 1946 were abolished, restoring the old name. The province covers an area of 1,157 square kilometres (447 sq mi) and a total population of about 200,000. There are 17 comuni (singular: comune) in the province. The province's economical relevance, once mainly based on the production of the famous white Carrara marble, has now shifted to the importation and fabrication of blocks of marble and granite from all over the world. 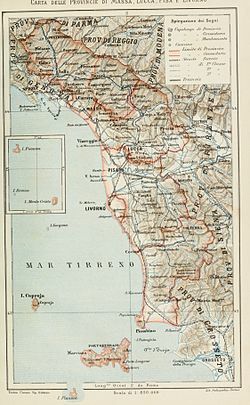 Wikimedia Commons has media related to Province of Massa and Carrara. This page was last edited on 21 January 2019, at 11:14 (UTC).